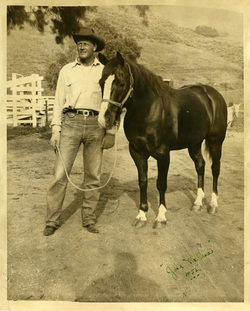 In the early 1930’s actor Joel McCrea, based on advice from close friend and mentor Will Rogers who suggested it would be a good idea to have something to fall back on in case acting didn't work out, bought and established a working ranch in the Santa Rosa Valley area of Ventura County, California. Joel and his wife of 57 years, actress Frances Dee, built their home here and raised their three boys in this wonderful and unique environment. The McCrea's loved the area and for many years were active members of the local community and supported many local causes. In the late 1950’s and early 1960’s parts of the ranch were sold for housing, which now makes up much of the northern third of the city of Thousand Oaks, CA. Today there are approximately 280 acres left of the original ranch. After Joel’s passing in 1990 and wishing to preserve what was left, in 1995 the McCrea family put together an agreement with the Conejo Recreation and Park District enabling the District to acquire the property. All the buildings on the ranch have been placed on the National Register of Historic Places and are being preserved for eventual sharing with the public. The Conejo Recreation and Park District, in conjunction with members of the McCrea family, has completed the construction of a new visitor’s center that is now open during scheduled events and programs. While there is much being done to preserve the history of the ranch and its famous owners, there remains a great number of items that need to be done in order to keep a series of 80 to 100+ year old buildings and their surroundings maintained. There are several pressing projects that need to be undertaken in order to retain the beauty and function of the ranch. 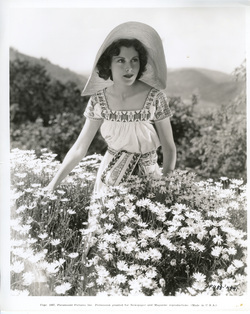 The Joel and Frances McCrea Ranch Foundation was formed in order to assist in the fundraising efforts needed to maintain a facility of this nature. 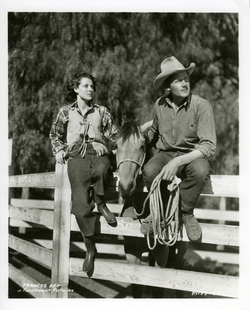 The primary mission of this Foundation is to honor and preserve the legacy of Joel and Frances McCrea by raising and managing funds to support the Conejo Recreation and Park District in the restoration, preservation and rehabilitation, as well as the interpretive and educational programs of the Joel and Frances McCrea Ranch. If you are interested in helping to preserve a piece of California history by making a tax deductible contribution to the foundation or would like further information please contact: The Joel and Frances McCrea Ranch Foundation, P.O. Box 548, Moorpark, CA 93020 or by clicking "Contact" above. The Joel and Frances McCrea Ranch Foundation is an IRS 501(c)(3) non-profit organization - Tax ID# 27-2628820.